Here is a golden opportunity for all those students who are interested in applying for Amar Ujala Atul Maheshwari Scholarship 2017 and could not submit their forms till 31st August 2017. The Amar Ujala Foundation has extended the final date for the online submission to 10th September 2017. Read more on this scholarship by scrolling down your page. Every year, the Amar Ujala organized a scholarship exam for the candidates. If have got marks above than 60% in your last exam then you can apply for this scholarship. The candidate should be a student of the class from 9th to 12th and their family income should be less than 1.5 lakh. If you complete all these guidelines then you can apply for this scholarship scheme. Amar Ujala Foundation has already released a notification for Amar Ujala Atul Maheshwari Scholarship 2017. The date of starting application is 20th August 2017. The Foundation has released this date on the same date. This year authority has clearly mentioned in the notification that only online application will be accepted for the scholarship. So, you can’t apply for the scholarship offline as per the previous years. You have to apply online if you want to participate in this scholarship exam. After the exam, the foundation will release a merit list after some days of exam. The candidates who will be selected they will get the scholarship from Rs. 30000/- (For 9th & 10th Class Students) and Rs. 50000/- (For 11th & 12th Class Students). The first 18 students of the 9th and 10th class will get Rs. 30000/- and the first 18 students of the 11th and 12th class will get Rs. 50000/-. 2 blind students one from class 10th and one from class 12th will get the scholarship of Rs. 30000/- and Rs. 50000/- individually. Total 38 students will get the scholarship from all the candidates. The Atul Maheshwari Scholarship Exam will be conducted in the month of November or December 2017. The result will be released after the few days of the exam. The result will also declare by the online mode. The authority will send you Admit card on your email to take part in the exam. Without the Admit Card, you cannot take part in the exam. The details about the admit card are also furnished on this page. More details on Atul Maheshwari Scholarship 2017 are mentioned in this article. Candidates have to gain 60% marks in the last class between 9th to 12th classes. Only those candidates can apply who are studying from a state board of education. The annual family income of the candidates should not be more than 1.5 lakhs. You should have all the necessary documents. Here is the complete instruction to fill Atul Maheshwari Scholarship Application Form. Check this out! Firstly, hit on “apply online” link which is given beneath. Later then, click on “Login/Sign Up” Button. Now, you will have to log in using your Google Account/Facebook. Moreover, you can also sign up. After that, you will have to fill the necessary details in the application form. These details are Email ID, Name, Age, Gender, Class, Marks %, Board Name, Postal Address, Name & Address of School, Exam City, Father’s Name, Mother’s Name, Annual Income of Family, Mobile Number, and Other Scholarship Details. When you have filled all these details correctly, attach the asked documents i.e. Last Year Mark sheet, Recent Passport Size Photograph, and ID/Address Proof. While attaching the documents, keep in mind that the format of the file should be only JPG, JPEG & PNG format and the file should not be more than 1 MB. After clicking on the “Submit” button, your registration will be completed. Check what’s next in the next para named selection process. 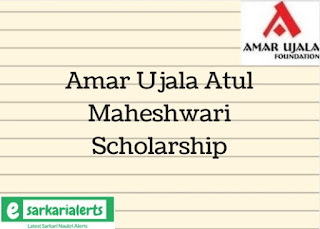 After completing the online registration process for Amar Ujala Atul Maheshwari Scholarship, the organization will announce the exam dates through the Amar Ujala News Paper. You can get the newest updates on Atul Maheshwari Chhatravritti Exam Date from our website. Before the examination, the Foundation will send the e-admit cards to candidates on their email addresses which are mentioned by the students at the time of registrations. The exam center details and date of test will be mentioned on this admit card. For Atul Maheshwari Chhatravritti Admit Card, please bookmark our website in your browser. While filling the scholarship form, candidates will have to choose a City for the examination center among 55 Cities. You can choose the proper city according to your comfort. So, friends, we hope that you are satisfied with the information which we have provided above. The online applications for Amar Ujala Atul Maheshwari Scholarship 2017 are started now. Don’t miss this chance. Fill your Amar Ujala Scholarship Form Now.